For my Birthday I used my Tax return to pick up a new camera to take on my trip to Mexico at the end of the month, behold my Nikon D5000. 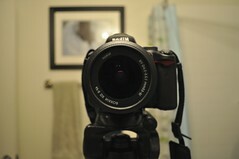 =) I’ve really been wanting to get a DSLR for some time now and I’m glad I was finally able to pick one up. I’ll be posting more pictures up to my flickr account now that I have a nice camera, you can see the 4 most recent in the top right of my blog at any given time. I’ll be sure to include a more detailed post about my camera and why I picked the one I did in a few days, but for now I need to get some sleep.